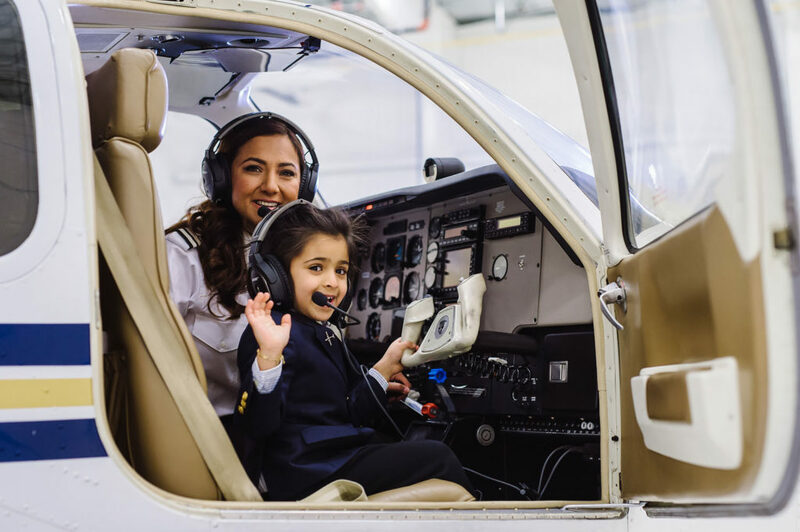 The first female certified civilian pilot from Afghanistan, Shaesta Waiz has a burning desire to help others like her to work hard, never give up and follow their dreams. My name is Shaesta Waiz and I thank you for visiting the Dreams Soar website! I would like to share with you a little about myself, along with the inspiration behind the Dreams Soar initiative. I grew up with my parents and five sisters in Richmond, California. We lived in an underprivileged school district where substitute teachers, sharing textbooks with classmates, and watching friends drop out of high school was the norm. I believed my future consisted of getting married at a young age and starting a big family. It wasn’t until I found aviation that I started thinking about having a career and going to college. After a long journey of pursuing an education in a non-traditional field, I became the first certified civilian female pilot from Afghanistan and the first person in my family to earn a bachelor’s and master’s degree — both from Embry-Riddle Aeronautical University. At Embry-Riddle, I also started the Women’s Ambassador Program — an initiative that seeks to mentor and support young women pursuing an education in aviation and engineering — then sought to advance my efforts to a global scale. I started Dreams Soar to share my story with women around the world, to let them know it is possible to achieve your dreams, regardless of the challenges and traditions you may face. The Dreams Soar mission is to partner with strong female role models at the stops along the route and together, share and promote the importance of STEM (Science, Technology, Engineering, and Mathematics) education. Every time I open the door to an aircraft, I ask myself, “How did a girl with my background become so lucky?” The truth is, anyone can be me. You must believe in yourself and allow your dreams to soar.